Day 771 - It's All Savannah, All the Time! I don't have to whine today about it being Monday, because I don't have to go to work! We had a great day yesterday - lots of family and lots of food. Heather and Savannah visited all day. My friend Cheryl also came to visit (with a box of pastries and a bag of clothes from the Oshkosh outlet for Savannah), and we had a big dinner for 9 or 10 people complete with homemade quiche, german chocolate cake, and a 13 pound ham. What vacation would be complete without nonstop FOOD? We (the adults in the house) TRY to remember to communicate with the other adults while we take turns holding the baby. I even got to 'babysit' yesterday for 45 minutes when Heather went to pick up Mike. Whew! What are we doing today? Probably more of the same! Day 770 - Overwhelming Cuteness!!! OMIgosh, how could any baby be cuter than Savannah? Heather visited from 9:30am yesterday till 6:30pm, and I got lots of cuddle time with Savannah. My sister Lyn and brother-in-law Steve are the hosts for the week, and taking good care of all the company. Hey - you know what? I like being a grandmother! I got to hold Savannah and walk her around. I got to watch her sweet face while she slept. I got to watch her when she was awake and looking around. I got to hear Savi hiccup, and her little sleeping noises. I got to see her smile. AND I got to hand her off to Heather if she cried, and she rarely did! It was just a lovely day spent watching Savannah BE, and we're going to do it again today! Day 769 - I'm in Savannah Land! I'm here, safe and sound, and today I'll get to hold Savannah! Can't wait for that! I am in the land of Savannah, where Dunkin Donuts, New York System Hot Dogs (aka gaggers) and Pizza Parlors abound. They have revamped the airport, removing some of the less-than-wonderful food places as well as adding a food court. One of the new spots is a 'Tootsies Orchid Lounge' (the famous one is downtown) eatery and bar, complete with live music. They had a man and woman duo yesterday, and the woman was very good, sounding alot like Reba. Anyway - my gate was next to 'Tootsies', so I could hear the singing as I waited for boarding. All of a sudden I heard a lot of commotion and cheering. People started leaving the gate area to go over there. Turns out the duo was singing a Billy Ray Cyrus song just as Billy Ray was walking by to go to his plane, and Billy Ray stopped and sang the song with them! Everyone nearby eagerly ran over to get his picture on their cell phone, while as many others (me included) called someone on their cell phone to tell them what was going on. Others patiently explained to their kids 'That is Hanna Montana's DAD', so all the young girls started squealing (as only young girls can). Moving along... Can't wait to see and hold Savannah today! Day 768 - Ready to GO! Greetings, Bloggy Weekenders and Vacationers! Not only is it Friday (march in a circle), but it is time for my vacation to see 'the fam' and meet little darling Savannah! Not much time to blog, because I had to finish packing this morning and actually UNPACKED almost everything to make sure I had the camera. Oops. I'll blog occasionally, as I have time. TTFN and have a great weekend and a great week next week! Day 767 - Vacation Tomorrow Afternoon! Greetings, Bloggy Beggin' for Vacation-ers! Here's another cute photo of Savannah. Babies are cutest when they are sleeping or smiling, aren't they? I'm going to make this quick, I have a lot of loose ends to tie up if possible before leaving for Savannah-land ( Sounds like an Emmylou Harris song). I think the two Davids (Cook and Archuleta) are my favorites this season. Either one of them winning would suit me very well, but I lean a little toward David Cook, bad hair or not. Have a wonderful Thursday and TTFN! It's Wednesday already and I haven't caught up yet. I've worked 11 hour days each day so far this week, and missed exercising. Oops. The door flew open on the passenger side of a car, which had not stopped, nor slowed down. An adult man tumbled out (mercifully not getting hit by the car behind), rolled on the pavement, then got up and hurried away, crossing the street away from the car that had 'deposited' him. The car kept going. What on earth could that have been about? Drug deal? Intimidation? What do YOU think, bloggy darlings? Day 765 - Random acts of kindness? Is it a random act of kindness when the butthead who passes you on a double yellow line uses his turn signal? Is it a random act of kindness when a misguided parent brings their kids into the hot tub like a kiddie pool and smiles fondly at you when you exit? Is it a random act of kindness when nobody makes coffee at work so you always get a fresh pot (because you make it yourself)? TTFN and have a great Tuesday! Three days till Vacation!!! I can't complain that it's Monday (for a change), because I leave FRIDAY AFTERNOON for a nice long visit to New England to meet little Savannah in person. She's already been hearing me and seeing me via webcam, but maybe she thinks I'm a cartoon... Yeah, yeah, pretty accurate, I know! Hey, Buddy Joe - you will want to know that when we went to Papa Boudreaux's Cajun place on Saturday afternoon - they have Shrimp 'n Grits there now, and MAN IS IT EVER GOOD! The waitress told me they usually sell out in about 2 hours so better get there when they open like we usually do. Feel free to go with Charlie while I am away. They are open Sunday now. Day 763 - Happy Easter! Savannah is waving to you with her Easter Bunny ears. I have a big bunch of flowers in the Den that I bought yesterday. The arrangement is actually three different bunches that were on clearance for $1 a bunch at the grocery store yesterday, and I put them all together in one vase. They are lovely, I need to go take a picture of them! We are also going to spend some time this morning trying to diagnose why our refrigerator is getting water underneath it sometimes. Probably just needs cleaning and the drip pan emptied. Is that a nice Easter project? We are having a ham dinner later, I just need to decide whether to make mashed or baked potatoes. I've had a very nice and very busy day. I did a triple water workout today, the 8am, 9am, and 10am classes. Then I had to go in to work for a little while. Then Charlie and I went for a drive on the Natchez Trace Parkway. Then Charlie I had dinner at Papa Boudreaux's Cajun Cafe. We just got home and I am going to sit down, read my book, and fall asleep in the recliner. Day 761 - Good Friday in More Ways Than One! It's Good Friday and Easter Weekend - we don't have any big plans, my big plans start the weekend after when I go to New England. 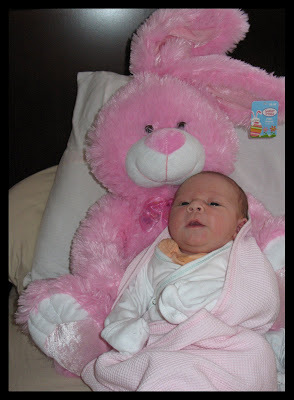 Miss Savannah has an early Easter present - her very first Easter Bunny. Very cute and very pink! I had a very stressful and busy day yesterday - but the good news is it wasn't as bad as it could have been. Hopefully today will go much more smoothly. Better get at it! Have a great Friday and a great Easter Weekend, everyone! TTFN! Day 760 - Is it Spring yet? Is today the first day of spring, or tomorrow? I don't have time to go check. No time for bloggage, our big upgrade is going live this morning and I need to go. Heather, Lyn, and Steve - get well and stay well! I'll be visiting soon, and I expect everyone to be germ free by then. Of course that means I'll catch a cold right before I go. Hey - changing subjects - are little kids supposed to have tattoos? There was a little boy at the pool this week who couldn't have beem more than 6 or 8, and had two tattoos and they didn't wash off in the water. Would that have been a henna tattoo? Do they just wear off vs. wash off? Have to make this short - have a nice midweek and TTFN! 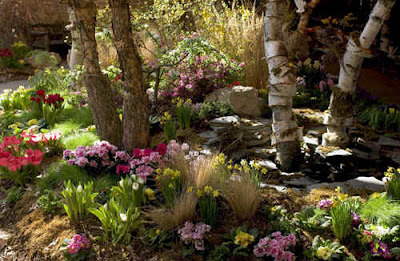 Here's a pretty spring scene for you that I found on the web. I have a cute photo of Savannah that I am saving for later in the week. The trees and forsythia are blooming here in the South, and it is just lovely! Poor Charlie has already started his seasonal yard work - he says he's busy cutting green onions instead of grass. Thanks, Charlie! I think Charlie and I should take a drive this weekend and look for signs of spring. Doesn't that sound good? Almost exactly a year ago, my sister Lyn and her husband came to visit, and the weather was wonderfully warm. They stayed a couple nights at the Opryland Hotel, and went to the Grand Ole Opry, then stayed with us for the remainder of the visit. We took a drive on the Natchez Trace parkway, and did some sightseeing, and toured Carnton Plantation and the Civil War graveyard. You can look back in the bloggy archives if you want to hear more about that visit! Oops- it's 6am - time to get ready for work! TTFN! Day 757 - Happy St. Patricks Day! Savannah looks a little worried because she isn't wearing green. Sorry I don't have more time to blog this morning, I got busy looking up family crests on that www.houseofnames.com website. Happy St. Patricks Day, and the Luck 'O the Irish go with you! I read on the web that we were supposed to celebrate St. Patricks Day yesterday, so we wouldn't conflict with 'Holy Monday' tomorrow. Oops, I didn't know. Happy St. Paddy's Eve, folks! 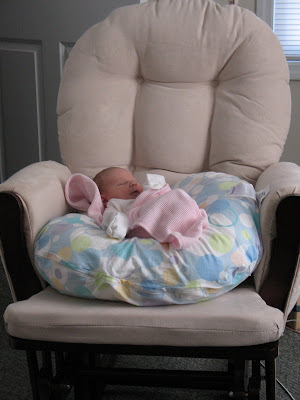 It's Sunday, and here is another darling photo of Savannah, in the rocker I sent to Heather for her baby shower gift. I know she'll be using the rocker a lot as time goes by! Charlie made me laugh this morning at 6am - his country expressions are sometimes unknown to me after all these years! You know how people say 'Uncle! ', or 'I give!' when they have had enough roughhousing? When Charlie was growing up, he learned from his Dad to say 'Calf Rope' for that situation. I just had never heard him (or anyone else on the planet) say that before, so I spent a good fifteen minutes chuckling about the newness of it and teasing him for making these things up. Charlie even tried to find it on the web, but evidently nobody who says it uses the internet... Ha! TTFN! We're leaving shortly to go swim! Day 755 - Big News! 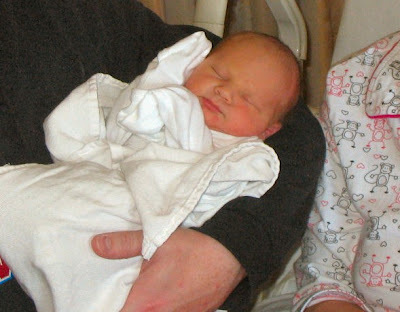 First - here is a darling photo of Savannah I cropped from another one. She is just PRICELESS, look at the hint of a smile on her little precious face!!! Aaaww!! I am so surprised that a week old baby can have such a personality! Good job, Heather and Mike! I have to go out the door for water aerobics, but Buddy Joe called yesterday with some BIG NEWS! The parties responsible for my layoff two years ago were TERMINATED yesterday. Payback is a &^%$, but I feel very justified being THRILLED to hear it. That's all - it is not appropriate to discuss, but it made MY day and a lot of other peoples' days yesterday. Day 754 - Hey! Why can't I march in a circle? This photo of Savannah 'concentrating' is priceless! 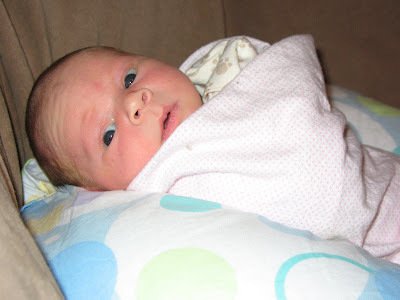 Can you believe this little munchkin just turned ONE week old yesterday? I'll bet she was thinking - 'I don't know what I'm looking at, but I wonder if it's FOOD'. Day 753 - Running Late! Charlie spent the night away fishing last night, and I didn't set the alarm for this morning, so I am running late. Hooray! No problems with the overnight jobs last night! Woo Hoo! It was 74 degrees yesterday, and the peepers in the creek are peeping up a storm every time I am outside. No time for bloggage, but have a nice day and enjoy the picture! Heather - I'll check in with you after I get home, it won't be until after 8 your time. 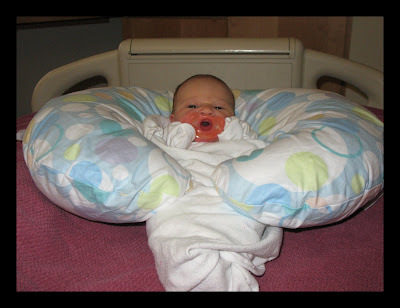 Here she is, the cutest Savi girl EVER, nestled in her boppy pillow! Please note the pacifier in her mouth - hilarious! How adorable is THAT? Cooo Cooo Cooo - gush gush gush. I need to make this short, I am already running late this morning because I needed to check a job at work. Day 750 - Savannahville - I like that! Heather and Savannah come home from the hospital today! Hooray! Mom (and let's not forget Dad) and Baby are doing fine, and I'll be getting lots of pictures very soon and 'visiting' with Savannah on the webcam. Is everyone tired today after the time change? Phil and Tiff, I don't think you've had the change to Daylight Savings Time yet? It's Cracker Barrel Monday today with TY and SY - we're going to the new one in Spring Hill - MAYBE they will have the full menu! Sorry this is short - I had to check my email and pay for a sweatshirt on eBay. Have a great Monday, 'Welcome Home' Heather and Savannah, and TTFN! Did you remember to turn your clocks ahead last night? I should have reminded you, but I didn't! I've had a busy day so far. Researched a problem with a weekend job on the computer when I got up. Heather called when we were driving to the health club, so we got caught up on Savannah. We went for a swim this morning. It was nineteen degrees outdoors and the air temp at the pool was only 66 - the water temp was 83, so it was OK! I went to the Super Target grand opening in Spring Hill, TN. It was packed, and I didn't have all the success I was expecting. The new super duper Target grocery doesn't carry several of my 'core items' that I need often - Diet Tropicana 2-liter drinks, 2-liter Lipton Tea, Sunsilk spray tangle remover for hair, and Pert shampoo, to name a few. Charlie and I had to go to Walmart after lunch to get the things we couldn't get at the Target grand opening. That kind of defeats the purpose of going, doesn't it? This afternoon I am working a database issue with my manager and the on-call DBA right now too. Joy of joys. It's Savannah Saturday and we had Savannah Snow last night. Are you already tired of how many times I have typed 'Savannah' over the last few days? I just talked to Heather. Savannah is keeping her busy already and not letting her sleep. No surprise there for anyone who has had an infant! 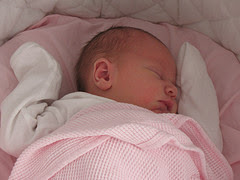 The pediatrician has been in to see her and check her out. I just made huevos rancheros for breakfast, and I WILL COPY OVER MY TAXES TODAY AND GET THEM READY! I am also in the mood to make jam. By the way - I haven't said that Savannah is 19.5 inches long - I didn't have that info the first day! Gotta go - maybe more later! Greetings, Bloggy Weekenders and Well Wishers! Here's another spectacular cell phone photo of little Savvy! 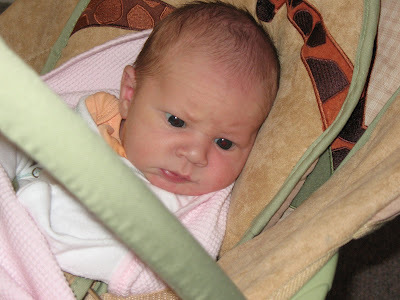 Doesn't she already look alert and interested and all pink and cute and stuff? Makes me want to go SHOPPING - I guess that's not new! Task for all you bloggies out there - if you see clothes or cups or plates or towels with 'Savannah' on them, let me know about it! And to top it off - it's Friday! More reason for celebration! I talked to my daughter on the phone for 35 minutes last night while she was holding Savannah, and I got to hear some of her cute baby noises! Speaking of the world, we are getting a 3-5 inch snowfall tonight, that's the most snow we've had in a few years. I think it's Savannah Snow. 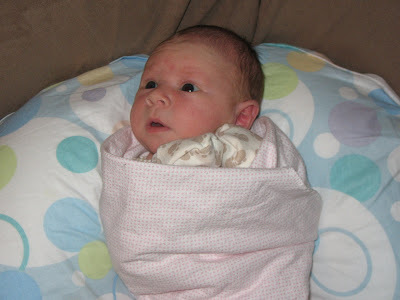 Day 746 and a half - We have a baby! 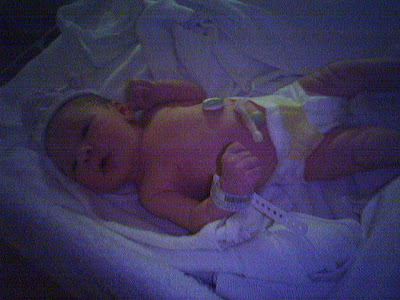 Savannah Lyn was born at 5:42pm Eastern time, weighing in at 7lbs, 1oz and delivered via c-section. No length information yet. Mother and baby are doing fine, thankfully!!! Here's the first picture - kindness of Evan and his cell phone! He says she's just perfect and beautiful! Day 746 - Big Events Happening Today! If all goes as planned, I will become a GRANDMOTHER today! Today - 03-06-08! I am sure we all have highly interesting labor stories, don't we? For example, did you know that I was born early, at home, in the BATHROOM, and my first bed was a DRAWER that served as a bassinet? 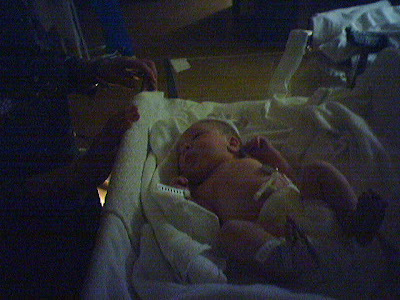 My mother had no help at all with my birth, she said I just 'fell out'. She called the doctor and explained that she just had her baby and the doctor didn't believe her! When I was in labor with Heather - I could overhear crazed women in the community labor room cursing their husbands? 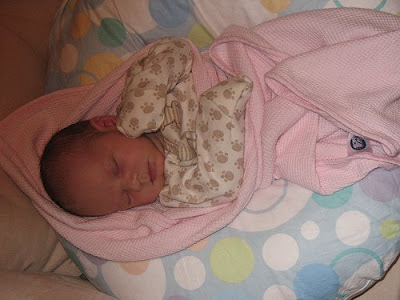 I went into labor ON Heather's due date, but it took so long she was actually born at 2am the next morning. Oops! It's quarter after 6 - I need to go! Everyone think positive thoughts today for Heather and Savannah! 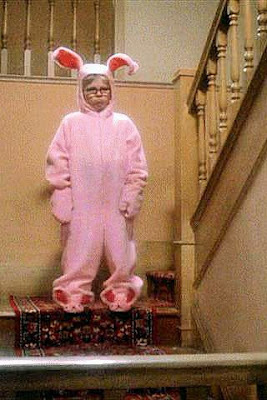 Do you have your bunny suit ready for Easter? There is a little boy at the pool who IS a real life 'Ralphie' from 'A Christmas Story'. He has a swimming lesson on Tuesday afternoons, so I have seen him several times. He gave me a little wave yesterday, so he recognized me too. He looks like Ralphie, he talks like Ralphie, and his name is 'Cameron', which is SO appropriate for his personality type. Yesterday his swim instructor and the lifeguard asked him to do his 'Elvis impression'. He climbed up out of the pool and did a 20 second Elvis - a full-body jiggle while strumming his air guitar. I couldn't hear what he sang because I was in the water, but it was hilarious anyway. He leaped back into the water afterwards with a big splash, grinning with pride. Complaint: His 'swim teacher' is a high school senior, and the lifeguard is a teenager as well. I thought to myself - 'Well, I'm a senior too. A SENIOR CITIZEN that is'... Well, almost anyway. Have a great Wednesday, everyone! Or - Happy Cinco de Marcho! After an exceptionally yucky Monday yesterday - my overnight jobs ran smoothly last night, meaning we are in good shape to start the day without several hundred unhappy people. Oops - just got an email about a different issue that I'll need to look at when I get in. Today, the temperature is starting in the 60's and will fall to the 30's by the end of the day. Jeepers - it's quarter past 6! Gotta go and have a nice Tuesday! No time for bloggage this morning. My overnight jobs are running late - we had problems with them yesterday too. This morning (getting up at 4:45am) I hosed up my PC at work (I remotely log in) so I can't look at anything on that PC until I go into work and reboot it. Sheesh. All in all, feels like a Monday. Charlie woke up in the night and just said one word, like 'Lucky', but I can't remember the word now! I hear the coffeemaker gurgling - and we are having 'snack day' at work today to celebrate the return of a team member from Maternity leave. We're leaving soon to go swim, but I'll just say hello and tell you that we went on an outing with our friends TY and SY yesterday. We had a really fun day! Highlights - we went out for lunch at a catfish place called 'The Rusty Fish Hook' in Linden, TN. We all had grilled catfish smothered in grilled tomatoes, onions and peppers, and side items of coleslaw, white beans and hush puppies. You won't believe where we ended up! We had a flyer about 'Grinders Switch Winery' - which we visited. If you think you've heard of 'Grinders Switch' before - it's because Grinders Switch is the home town of Minnie Pearl (Sarah Cannon) of the Grand Ole Opry, who used to tell a lot of stories about folks in Grinders Switch in her performances. It's the first winery I've been to that looks like a log cabin! Here is their website. We bought a couple bottles of their wine named 'Pearl', in honor of Minnie. OUCH! Nothing like a little fractured English with your wine! Day 741 - Happy Marching! Greetings, Bloggy Marchers! Happy March 1st! March can feel very springy, or March can be very cold and wintry. You know it's true. Want to know more about the month of March? All we need here is one really warm day and all the trees will start flowering. Tomorrow is supposed to be 68 degrees (just for one day, and the next day won't get out of the 30's), and I think that'll do it. Well - not much time for bloggage here, we are accompanying our friends TY and SY to Linden and Hampshire TN today on a day trip. Have a great Saturday, and a Happy March! TTFN!